Silent Nights | News and Features | Style Weekly - Richmond, VA local news, arts, and events. Scott Elmquist A candlelight procession at Sacred Heart Catholic Church is part of a nine-day posada, recreating the Bethlehem pilgrimage in song. Singing Christmas carols, kissing under the mistletoe, baking gingerbread — there’s a general consensus about holiday traditions. Yoga doesn’t tend to make the list. But local churches and outreach centers are embracing such unconventional programs in an effort to attract the unreligious and folks with different cultural backgrounds. On Park Avenue, Claudine Varesi manages Lucid Yogi. It’s a sparse studio, intentionally devoid of intimidating paraphernalia. An hour of silent reflection marked her Candlelight Yin ceremony on the winter solstice, Dec. 21. Varesi, who’s from Mexico City, wants to cultivate a cosmopolitan clientele — including immigrant Latinos. According to a 2013 Pew survey on religion, Latinos are at the heart of a growing trend. One in four Latinos refers to themself as a former Catholic. Asked to identify with a denomination, many of them claim none, although they consider themselves to be spiritual. “I think you’re seeing a shedding of Catholicism, for example, in favor of folk roots,” Varesi says. 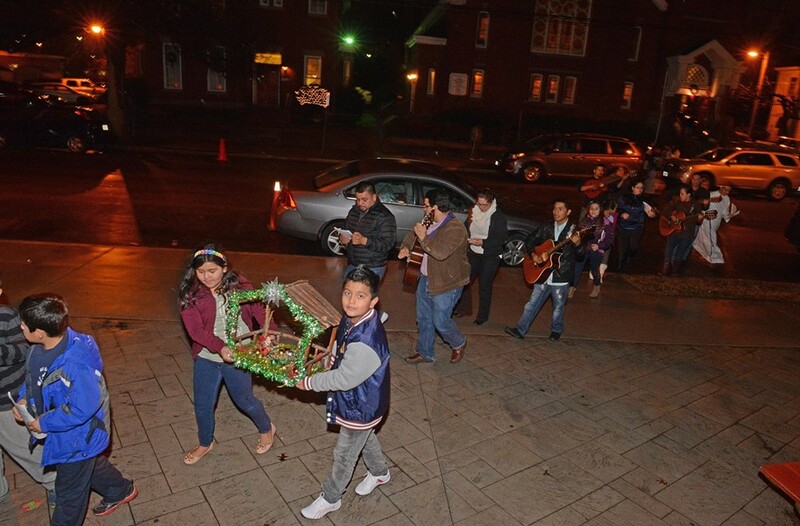 Posadas, which last for nine days starting Dec. 16, recreate the Bethlehem pilgrimage in song. The candlelight procession eventually moves indoors to break open a piñata. Seven groups will perform across Richmond, Auerbach says. And to some parishioners, this is a lifeline. “As a child, I was really into posadas,” says Alfredo Arreola, a business administration student and member of Sacred Heart. “It’s comforting to find that in Richmond.” Arreola’s family still lives in Mexico. While tradition may address a deep need, there are other avenues of outreach churches are exploring. Richmond has no Spanish-accessible mental health services, for example. Varesi, who spent 15 years in Washington as a multicultural liaison, agrees. She says that at Lucid Yogi, the longing for connection is fulfilled through self-inquiry. Cutting out language altogether is the strategy behind certain services at St. Stephen’s Episcopal Church. Director of Communications Sarah Bartenstein expects a diverse crowd for Celtic Christmas: Contemplative Communion, which will be held Christmas Eve. The service reaches back into antiquity, to the origin of modern Christmas rituals. “True, churches don’t usually focus on physical fitness,” says JoAnn Bibb DeForge. “This church, though, is very conducive to wellness.” Since the fall, she’s taught two styles of yoga and a meditation class called Into Stillness at St. Stephen’s. A class on food guru Michael Pollan will be offered this winter.